Camden cyclists and its Council have defended the borough’s pioneering armadillo-and-planter segregated cycle lanes a success, despite damage to the infrastructure caused by motor traffic. 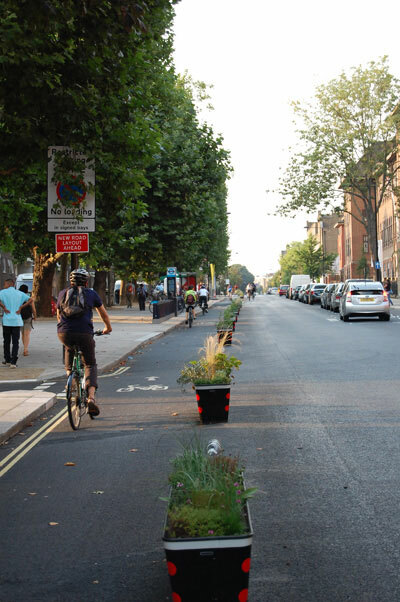 The comments come in response to a letter to the Camden New Journal from a cyclist branding the route a ‘failure’ after several planters and armadillos were knocked by parking and passing motor vehicles. The ‘light segregation’ on Royal College Street, which could be seen replicated across the country, was 80% cheaper than traditional kerbs to install, and has seen a 49% increase in cyclists and traffic speed reductions of up to 21%. In his letter to the Camden New Journal, Rob Cole said: “As someone who has been using this cycle lane for many years, every day, I have been saddened to see how quickly motor vehicles have ruined this new lay-out. Jean Dollimore, Joint Co-ordinator of Camden Cyclists, said: “The reality is that the damage was caused by careless drivers and Rob Cole jumped to a conclusion and pronounced the new cycling scheme in Royal College Street a failure. “He also mentions contention between cyclists and people getting out of cars – when the parking is moved out a bit (by end of January), this problem should go away,” she added. Where cars have reversed into planters along parking bays Camden Council will install flexible bollards, while moving parking bays to create a 500mm buffer zone between cars and the bike lane. “Despite these issues the project has clearly shown that light segregation is an effective approach to protecting cyclists from traffic and one that can help to make cycling safer and more attractive. We firmly believe that this approach is a model that would allow a network of cycle routes to be relatively quickly installed in London and elsewhere in the UK at low cost.